When I was a little girl, my parents had a cartoon philosophy book in our library. I loved that book – probably because it was the only book with illustrations in a room full of hardbound theology books and bible commentaries. As an adult, I now see the humor in the book – it was a simple book with a different philosophy exemplified on each page by a hand-drawn pig. 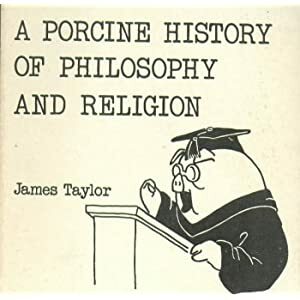 There is a Socratic pig in deep conversation with a disciple, a Franciscan pig with his congregation of animals, and two Sartrian pigs in the days of the resistance. We see a Presbyterian pig searching for signs of grace (with a magnifying glass), a Campbellite pig being silent where the Bible is silent, and a follower of Kierkegaard demonstrating a leap of faith. Hysterical, right? Anyways, I would always ask my parents to explain the book, being that at age seven, I hadn’t had the requisite course in humanities to get the underlying humor. My mom would patiently explain the pictures to me as I questioned her: but WHY is the Stoic pig standing out in the cold? But WHY is the Nietzschean pig a Superpig? I also remember that I would stare at the pictures and wonder which one was my favorite philosophy. I kept coming back to the picture of the two pigs reclining and eating grapes. They seemed the happiest. My mom explained that they were hedonists – people who devote their life to pursuing pleasure. That sounded awesome to me. I decided that I was a hedonist. I’m not sure my mother was thrilled with that idea. Somewhere along the way, I lost a sense of my hedonist ideals. Probably somewhere around 16 or 17, right when the rest of my peers were diving head-first into the reckless pursuit of pleasure, I began the Pursuit of the To-Do List. I’m not sure what lead me to do this. I suppose it’s a combination of being the oldest child, along with a naturally choleric temperament, fueled by some innate need for affirmation? I abandoned the pleasure principle in favor of being the “responsible one”. Even at that age, I had a hard time slowing down, and an even more difficult time saying no. I remember my dad got a corporate gift every year – a daytimer. (For those of you in your late 20’s, daytimers are what we had before palm pilots. For those of you in your early 20’s, palm pilots are what we had before iphones.) The daytimer was fancy and leatherbound, and my dad always gave it to me because he preferred his pocket edition. The daytimer made me feel very important. Every year of my high school career, I made it a goal to fill my daytimer up with activities and commitments. Are Wednesday looking slow? Perhaps I should join the yearbook committee. Nothing to do between last period and play rehearsals? Might as well join the swim team. Weekends freed up for relaxing? No, perhaps I should join the Young Lawyers Club. That will look good on a resume. I’m afraid this habit has followed me into adulthood, and I’m now finding myself really struggling to make pleasure, or even self-care, a priority. I take care of everyone else all day. When I’m not doing that, I’m constantly feeling the pull to do something else on that to-do list. Work on my syllabus. Write a blog post. Clean out my email inbox. Get the laundry done. It is very rare for me to just do something for fun anymore. In fact, I would say that I can go weeks at a time without doing something just for pleasure’s sake. I know that the season I am in is unique, but I also know that I am in charge of my own life. And I am often perplexed when I find myself up until 2am still trying to write off one more email, and then whining that I never have time to read, or sit in the sun, or cuddle with the kids. I just have a really difficult time with relaxing. Even to the point of not going to bed. When I relax, I start to get itchy about all the things I should be doing. In fact, I think I actually enjoy the planning of a vacation more than I enjoy the actual vacation. Because there is effectiveness in the planning. Relaxing is ineffective. Did I just say that? Did I just quantify the passage of time based on how effective I am being at any give moment? The secret of life is enjoying the passing of time. Let’s all breathe that idea in for a moment, shall we? I’ve decided that I really want to lean into my hedonist side a little more. Don’t worry – I’m so far on the other side that this will likely involved nothing more shocking than sitting still for a pedicure. But really, I’d like to see myself sit and read a book while the kids are on the trampoline, instead of scurrying around the backyard cleaning. I’d like to take the time to download a list of song that *I* like onto the ipod, and then actually listen to them. I’d like to take a walk after the kids go down. I’d like to call a friend in the middle of the day instead of returning emails from strangers. I’d like to watch So You Think You Can Dance instead of CNN from time to time. Are there any other anti-hedonists out there? Anybody else needing reform in enjoying the passing of time? Should we join forces, create a support network? Perhaps I could start a blog for us. Then we’ll probably want a message board. I can work on that. Maybe form a non-profit? I better write this down. Becoming a hedonist is going to take a lot of careful planning and organization. I’m making it sound really fun, aren’t I?